IT TOOK AWARD-WINNING FILMMAKER Julia Bacha five years to complete her most recent work, Naila and the Uprising, but the film tells the story of a history that Palestinians have wanted to see on screen for much longer. For the past decade and a half, the 37-year-old Brazilian filmmaker has worked to document resistance to the Israeli occupation, including by directing the critically-acclaimed 2009 film Budrus, in which a Palestinian community organizer fights against the expropriation of West Bank land. She is currently the creative director of Just Vision, a nonprofit that works to build awareness and support for Palestinians and Israelis fighting for equality and human rights. Activists in the region have long told Bacha that they were inspired by what happened during the First Intifada, when women were at the helm of a nonviolent movement to end the occupation. “[Local activists] felt it was really important for Palestinians to go back to a period of real partnership between the political parties, with women leading the way,” she told me. “It was really important to bring those role models back into the current generation.” Bacha was surprised to discover that there wasn’t already a film documenting women’s participation in the uprising. It’s this absence in the cinematic record that Bacha eventually set out to rectify. After interviewing about 20 women who played a central role in the uprising, Bacha’s team decided to structure the film around one of these activists, Naila Ayesh. 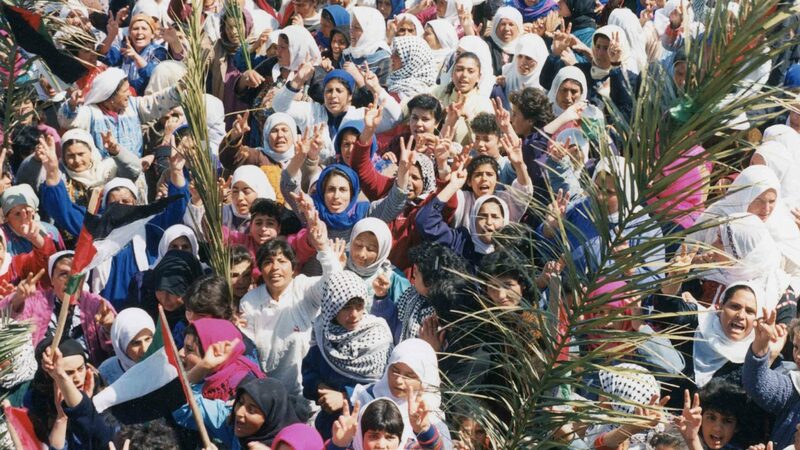 For many viewers, watching Naila will mean learning for the first time the history of the First Intifada, an uprising that began in 1987 and ended with the peace negotiations of the early 90s. The viewer journeys with Ayesh as she joins the struggle for national liberation and braves an increasingly repressive occupying force—a journey which eventually lands her in prison with her then-infant son, Majd. Now a young man, Majd has no memory of what happened and is, like the viewer, hearing his mother’s story for the first time. Naila does the crucial work of destabilizing Orientalist assumptions about the role of women in Palestinian society. It’s also a reminder of the almost universal nature of the struggle for women’s liberation—that progress is never linear; that the goals of other movements are constantly given precedence; and that even histories carried amongst the living may be buried or warped. The film also reminds us that none of what unfolded during the First Intifada was fated. There was nothing predetermined about the decisions made by Ayesh and other Palestinian women, no guarantee that the boycotts and general strikes would undermine the Israeli stranglehold as they did, nothing inevitable about the exclusion of women and civil society from the peacemaking process by Palestinian leadership. That’s a truth we need to hold onto in 2018. Trump and Bibi are undoubtedly frightening, but their power is not absolute. The Great March of Return in Gaza and a shifting political climate in the United States remind us that the road to the future isn’t already paved, and that our continued participation matters. To borrow the words of historian Jeanne Theoharis, Naila and the Uprising tells the tale of a “history we need”—it’s a story of resistance that enables us to imagine the power and possibility of the present moment. I watched Naila at New York City’s IFC Center, when it was screened as part of the Human Rights Watch Film Festival. After seeing the film,I reached out to Bacha to chat with her about it. This interview has been edited for length and clarity. Aviva Stahl: There are two forgotten histories in this film: both how Palestinian history has been repressed or distorted as a result of the occupation, as well as the gendered way Palestinian history has been recorded. Was that something you thought a lot about when you were making this film? Julia Bacha: It was definitely the hardest film that I’ve ever made, because I am used to having a camera in my hand and filming in real time what’s happening. This is not the case [with this film]. We were dealing with a movement that was clandestine, so they did not document it themselves. With the story of women, even in societies that might not be as traditionally patriarchal as Palestinian society is, women generally don’t get documented in protest movements. The cameras kind of have a way of focusing on the man. That then becomes the sort of raw material that historians have later for patching together what happened at the time. Fifty percent of the story is missing in most of these historical accounts. We really wanted to make up for that, and provide the other 50%. AS: Tell me about the use of animation in the film, and what that meant as a creative choice? JB: That was, in many ways, a direct result of having to tell a story that has not been documented. This was the first time that I worked with animation. I was worried about it because this issue is very divisive, and people are quick to doubt narratives that go counter to what they grew up with. Using animation as opposed to real archival footage felt like it could be a stretch in that regard, but it was really the only option, so I just had to go for it. It ended up going from being a solution to a problem, and one I thought could create more challenges, to being the heartbeat of the film, and actually the part that people respond most powerfully to. AS: Have you been surprised by some of the reactions to the film? JB: I knew the story was important and hadn’t been told, and so I knew that many people would appreciate it, but I also didn’t know that the film would land at a time when [the topic of] women’s invisibility, and a women’s movement, would be so alive. The fact that today’s movements here in the US are being led by women, so many of them, from Black Lives Matter to the Women’s March . . . We’ve been getting so many requests from organizers across the country and around the world that want to use this film because they say, “This is my story too.” That has been really touching and very powerful to see. AS: What kind of challenges did the occupation pose to the filmmaking process? JB: The greatest challenge that I face—and it’s going to get increasingly hard, in fact I don’t know if I’m ever going to be allowed in again—is entering [Israel] through Ben Gurion airport in Tel Aviv. I’m not Palestinian, so I do not actually encounter the full force of this, but there is really significant racial profiling and harassment that takes place. The last time I went through, I was interrogated for seven hours. There are multiple people that come and ask you the same question. I’ve been strip searched. The last person that came to ask me the same questions that I had already answered 15 times was a man without a uniform. Came and sat right next to me, rubbing his leg against my leg, without anybody else in this room. It’s done on purpose. It’s done to create this kind of anxiety, which will basically make me make a decision not to do it, not to go. AS: Did the women you interviewed speak about what life is like for them today? JB: Women’s position, generally, has declined in Palestinian society since the First Intifada. We talk a little bit about the reasons why, at the end of the film. The Oslo Accords was basically a coup against Palestinian civil society, which at the time was being led by women. When the PLO was allowed to return from Tunisia, as a result of Oslo, women were put aside. They lost the positions that they had gained. There wasn’t any significant effort to build gender equality into the way that Palestinian society was reorganized post-Oslo. Not only that, but there were significant attempts at keeping women controlled, submitting women again to all kinds of second-class regulations. Women are still incredibly active in civil society today. They’re fighting back. They are very aware and I think a lot less romantic about things, which I think bodes well for the future, when Palestinian society will be able to organize and rise up again. Clearly, there’s a new generation coming up. Palestinian society is incredibly young. There’s a lot of vibrancy in it. There are a lot of movements for social equality happening at the same time as the movement for national liberation. Aviva Stahl is a Brooklyn-based journalist who writes primarily about prisons, national security, and immigration detention. Follow her on Twitter: @stahlidarity.